In a mouse model of congenital hypomyelinating neuropathy, investigators bred animals with an MPZ mutation that leads to congenital hypomyelinating neuropathy with another transgenic mouse that overexpresses neuregulin 1 type III. They found that the gene therapy approach improved symptoms and promoted myelination in both the peripheral and central nervous systems. Overexpressing the axonal protein neuregulin 1 type III increases the thickness of the myelin sheath and leads to restored myelination, as well as improvements in cell-to-cell signaling and functioning in animals with pathological features of congenital hypomyelinating neuropathy (CHN). CHN, a rare myelin disorder diagnosed in infancy, causes muscle weakness and low muscle tone, leading to neuropathy. The babies produce very small amounts of myelin. Studies have shown that CHN is caused by mutations in two genes: myelin protein zero (MPZ) and early growth response gene-2 (EGR2). Both genes make myelin to insulate nerve cells. MPZ encodes for a protein called P0 that allows for the formation and stability of myelin in the peripheral nervous system. Mutations cause a reduction in myelin thickness. EGR2 makes a protein that stimulates the production of myelin. The hope is that the delivery of a protein that modulates neuregulin 1 type III in neurons in the peripheral nervous system could be used to increase myelin thickness in patients with diseases that result in myelin damage. “If we can manipulate myelin thickness, it opens up the opportunity to treat other more common conditions like Charcot-Marie-Tooth disease and Guillain-Barré syndrome,” said Yannick Poitelon, PhD, assistant professor in the neuroscience and experimental therapeutics program at Albany Medical College and a co-author of the study, published online December 10 in Human Molecular Genetics. “The study led to some surprising findings that we are now trying to understand,” added Sophie Belin, PhD, a research associate in Dr. Poitelon's lab and first author of the study. Dr. Belin has been studying peripheral myelinating diseases at the University of Buffalo, where she continued her postdoctoral training under Lawrence Wrabetz, MD, director of the Hunter James Kelly Research Institute and professor of neurology and biochemistry at the University of Buffalo. Dr. Wrabetz is senior author of the current study. The mouse model, developed in the Wrabetz lab, mimics CHN pathology. The myelin is too thin, and as a result the nerve conduction velocity is reduced. Dr. Belin has been using the animal model to determine ways to increase the thickness of myelin. They asked: Can the newly bred mice that have both reduced expression of P0 and overexpression of neuregulin 1 type III recover from the MPZ genetic mutation? To assess this, they looked at the pathology at the sciatic nerve, observing the quality of the myelin lining and its thickness. They measured nerve conduction velocity of the signals coming in and going out of the sciatic nerve. Finally, they wanted to observe if the mice were walking better. Still, the researchers had more questions: Were the animals really forming more myelin? Was the myelin normal? To understand which pathways were activated, the scientists looked at gene expression. Normally myelin is formed by Schwann cells. Glial cells wrap around the axons and allow for nerve conduction to muscles. The research team could see that this specific signaling pathway in Schwann cells was activated. But when they looked at protein levels in the sciatic nerves (compared with control animals) the composition was not what they expected to find with the increased myelin thickness. In fact, they discovered they were generating an alternative myelin product. This myelin protein normally controls cholesterol trafficking and is not the myelin that insulates axons. Changing the component of the material, they were able to increase myelin thickness, and the animal's ability to walk improved. The research team is now focusing their next experiments on PMP2. This protein, expressed in the Schwann cells of the peripheral nervous system, helps with cholesterol binding. “We believe that regulating the level of lipids can increase the thickness of myelin, and this would be specific for the peripheral nervous system,” explained Dr. Poitelon. The team is now creating Pmp2 knockouts to understand the effects of the protein. The advance is promising, the independent experts agreed, but more research is needed. Drs. Belin and Poitelon reported no relevant disclosures. •. Belin S, Ornaghi F, Shackleford G, et al Neuregulin 1 type III improves peripheral nerve myelination in a mouse model of congenital hypomyelinating neuropathy https://academic.oup.com/hmg/advance-article-abstract/doi/10.1093/hmg/ddy420/5237695. Human Mol Genet 2018; Epub 2018 Dec 10. 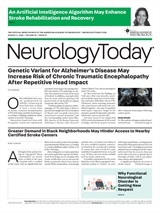 Neurology Today19(3):32-38, February 7, 2019.